New York State Attorney General Eric Schneiderman has just volunteered to take on the role of Special Prosecutor and investigate all police actions that result in the death of unarmed civilians. (See NY Law Journal article here, NY Times here). What hackneyed political nonsense. Citing a crisis of confidence in local prosecutors, and presumably because neither his telephone nor email was working, Schneiderman held a press conference to alert the governor to his availability. Were I inclined towards cynicism, I might view this as a cheap, opportunistic attempt at self-promotion. 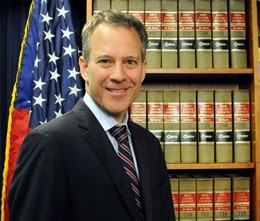 One might think Schneiderman, well aware that his office is a stepping stone to the governor's mansion (Andrew Cuomo and Eliot Spitzer were both AGs before their elections), was shamelessly using the public outcry over the deaths of Michael Brown and Eric Garner for political gain. One could also believe that Schneiderman's pose was pure hucksterism, and that the only thing genuine in his announcement was its underlying ambition. Were I more cynical, that is. Schneiderman is correct in one sense: much of the public may well have lost faith in the criminal justice system. That hardly means that the people are waiting breathlessly for Eric Schneiderman to arrive.